I have written about Community Supported Agriculture (CSA) more than once on this blog. It’s Friday; it’s been a long week and for folks with tired eyes, Community Sponsored Agriculture is a different model of food delivery with fewer hand-offs. For the last two years, I have been a member of Joel and Annalisa Wild Miller’s CSA in Lee, New Hampshire. I can visit their farm to pick up eggs, produce, meat, and raw milk, or I can meet them at local Farmer’s Markets. Between the food I grow in the summer and the food they grow all year-long, I have been able to limit my trips to “the grocery store” dramatically. Sure, I’m still not producing enough of my own food, but my supply line is shorter and I can shake the hand of the person who lovingly grew the head of cabbage I’m going to slice up for cole slaw today. It’s not a perfect model; Joel and Annalisa can’t produce fresh tomatoes in February. Despite the imperfections, this model of “shopping” is attractive and enjoyable to me and I am sometimes overzealous in my attempts to evangelize other people about CSA. This year, the object of my evangelism was my mother. My parents are orderly and organized; they like routines. My mother is disciplined about menu-planning and grocery-list making. She knows the prices of things in the store and she can advise you if you would like to know which grocery chain has the lowest price on Tide detergent. I mentioned CSA to her last February and she said she was satisfied with the things I grew in the garden; no thank you. I persisted. “Herman” may very well mean “stubborn” in German and when it comes to being persistent (aka stubborn), I am my father’s daughter. I have been known to hold on to something long after a reasonable person would have let it go. I know this a fault; I’m working on it. I’ve also learned to pick my battles and causes carefully. Besides, there was a beautiful CSA less than 3 miles from my parent’s house and it was utter foolishness that they did not want to participate. My mind was made up. My first step was buying a half-share at Little Ridge Farm. I met Keena Tracy one cold February day and brought her my check. She explained how she ran her CSA—she started in early May (depending on the weather and growth patterns) and pick-ups were on Tuesdays and Fridays. I think I almost believed the little fib I told her. I did come home for the first Friday pick up and I loved the “market” arrangement. It was neat and orderly and everything was clearly explained. It was almost like a grocery store! Things got busy in my life and I wasn’t able to pick up for the next two weeks; the lettuce I had planted in April started popping up in my own gardens, too. I was worried that my CSA share was lying fallow. I thought about roping my brother in on the scheme, but he’s older and wiser. I don’t think he wanted to be responsible for CSA deliveries to The Motel and he’s pretty busy, so he just picked up my half-share that week and enjoyed the spinach and kohl rabi. The time had come to tell the truth, sort of. Like a thirteen year-old girl caught smoking cigarettes in the basement, I told my parents I had purchased the CSA half-share, fully intending to come to Lisbon Falls every Friday night after work and pick it up. Helen seemed skeptical, but said she would pick up my CSA share the following week. “Don’t buy a half-share next year” she said. I won’t bore you with the details, but my parents started picking up my half-share every week and they also started buying eggs at the CSA. Keena was patient and kind and was available to discuss various and strange greens with Helen. At first, my mother was convinced I could grow all the same things she was getting at her CSA in Uncle Bob’s garden; I knew she meant it when she discouraged my future CSA participation. Yet, every week she would tell me some story about her trip up the Gould Road. Did I know that so and so who works at the library had a half-share? 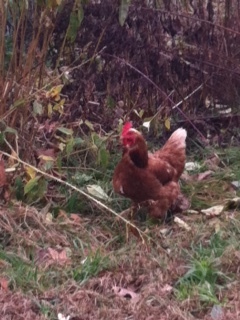 Keena was going to have organic, grass-fed chicken for sale in September—did I want to buy in on it? Oh, they sell raw milk at the CSA…did you want me to pick some up for you? 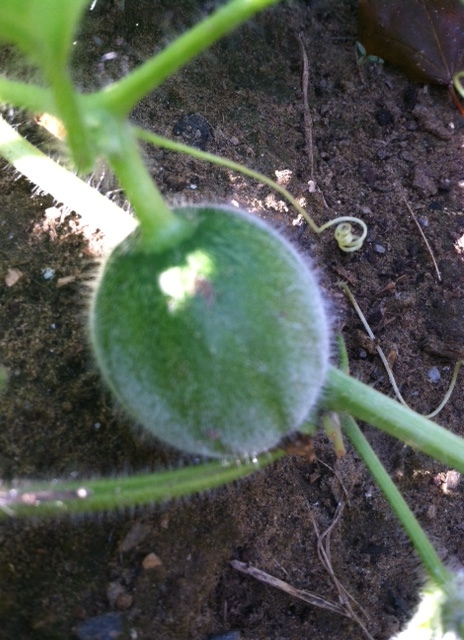 In August, the CSA cantaloupes arrived and they were bigger and sweeter than anything I had ever grown. Helen loves cantaloupes. One Sunday afternoon, Helen and I walked over to the garden. The melons I was trying to grow looked feeble in comparison to the ones from Little Ridge Farm; maybe they were smoking cigarettes. I don’t know what next year will bring. No one really does, but I am making my list of practical gifts for people on my short shopping list and I have a few ideas for my mother. In case you were wondering, I don’t smoke cigarettes, but I’m still stubborn. This entry was posted in Experiments and Challenges and tagged cigarettes, Community Supported Agriculture, CSA, Little Ridge Farm, Wild Miller Gardens. Bookmark the permalink. What a great story. I love your cigarette analogy. Thanks, Tammy! It’s always baby steps. I love this post, I found myself laughing out loud when Helen suggested you not grow melons next year because she can get them at the CSA. Only a mother could say that without admitting outright that her daughter was right about CSA’s! I hope you can learn a few tricks of the thirteen year-old mind from reading, Gwynsmum! Definitely older, but don’t know about the “wiser.” part. Keena’s Little Ridge Farm is great and the CSA is a tangible way to show support for local farmers and farms like this one. Also a great way to get fresh veggies. Loved this post. I never thought that Mom (Helen) would go for the CSA, but you knew better than me. There are multiple lessons in this about patience, relationships with parents, etc.